SodaStream, headquartered in the Israeli city of Lod, has its main factory in the West Bank settlement of Ma’ale Adumim. “Soros Fund Management does not own shares of SodaStream,” Michael Vachon, a spokesman for the fund, told The National, declining to comment further on when and why it sold the shares. In a May filing with the US markets regulator, the fund said it had bought 550,000 shares of SodaStream during the first quarter. Bloomberg reported that the fund acquired the shares for $24.3 million, with the new holding making up 0.3 per cent of the fund’s $9.3 billion stock portfolio. 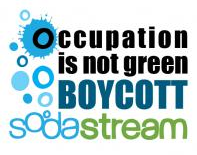 “After pressure from Soros partners in the region and the world, they dropped SodaStream and promised, in private letters so far, to issue guidelines similar to those adopted by the EU to prevent any investment into companies that sustain the Israeli occupation and settlements in particular,” said Omar Barghouti, the Palestinian activist and co-founder of the BDS movement. Several western investors said earlier this year that they had sold off holdings in companies that make money from business in occupied territories. Norway’s $810bn sovereign wealth fund, the world’s largest, a Dutch pension fund, and the Presbyterian Church in the US are among those that have excluded some Israeli and US companies from their portfolios this year. The companies operate in the occupied territories, where settlements built by Israel have been deemed illegal by the UN Security Council and the International Court of Justice among others. Financial and economic boycotts have been tried before, most notably when Saudi Arabia and other Opec members stopped selling oil to the West in 1973 in reaction to the support given by the US and other nations to Israel during its war with Egypt. But with the 1979 peace agreement that heralded a political and economic rapprochement with Egypt and eventually other Arab nations, the momentum fizzled away. It is only in the past decade that there has been a revival of the boycott movement looking to end the Israeli occupation of land captured during the 1967 Arab-Israeli war, allow Palestinians refugees to return home and end discrimination against Palestinians. Analysts say that as the two-state solution – the framework in which peace negotiations have been undertaken for the past two decades – flounders, a growing anti-apartheid movement is filling its shoes. This year has been a strong one for BDS. The Gates Foundation Asset Trust, which manages investments for the $40bn Bill and Melinda Gates Foundation, said in June that it sold its stake in the UK security services firm G4S, one of the companies targetted by BDS. The movement has also been in focus during the Israeli assault on Gaza and the widespread anti-war protests against the killing of hundreds there. Earlier this year, Israel’s finance minister acknowledged the impact that a European-wide boycott could have on the country, depriving the economy of $5.7bn and putting almost 10,000 people out of work immediately. The prime minister Benjamin Netanyahu has also acknowledged the threat posed by BDS. In a March speech in the US, Mr Netanyahu launched an attack on the movement, branding them as racists. In January, Norway’s sovereign wealth fund decided to ban Africa Israel Investments (AFI Group) and its subsidiary Danya Cebus from its portfolio because of their involvement in building settlements in the West Bank. In the same month PGGM, the second-largest Dutch pension fund, which manages more than $200bn in assets, said it had liquidated holdings in five Israeli banks for their role in financing settlement building. In June, the US Presbyterian church said that it excluded three companies – Caterpillar, Hewlett-Packard, and Motorola – from its investment portfolios because they were used by the Israeli government in the occupied territories and were not in compliance with its policy on socially responsible investing. Norway is one of the few countries that have an ethics oversight council to review investments made by its sovereign wealth fund. In January, the finance minister, on advice from the council, told its sovereign wealth fund to sell its holdings in AFI Group and Danya Cebus. Since the outbreak of fresh violence in Gaza, there have been no new announcements of boycotts by big investors, but funds such as Norway’s are constantly reviewing their investments according to the ethics council that monitors its holdings. Lisa Stonestreet, the programme director at the London-based UK Sustainable Investment and Finance Association, a non-government trade body that promotes sustainable investment, said that institutional investors were increasingly focused on ethical factors. “First of all there is a public demand for it in terms of people calling into account larger organisations across the board to look at what the impact is in terms of sustainability, in terms of what the impact is and social issues,” she said. For some investors, the main aspect is profitability. The Canadian Pension Plan Investment Board, which manages more than $200bn, has investments in a number of Israeli companies, including SodaStream and Bank Halpolim, as part of its foreign portfolio of stocks. Those holdings were part of its indexing investment strategy and the fund had no plans to sell them as it focused only on potential for profit, said its spokeswoman, Linda Sims.